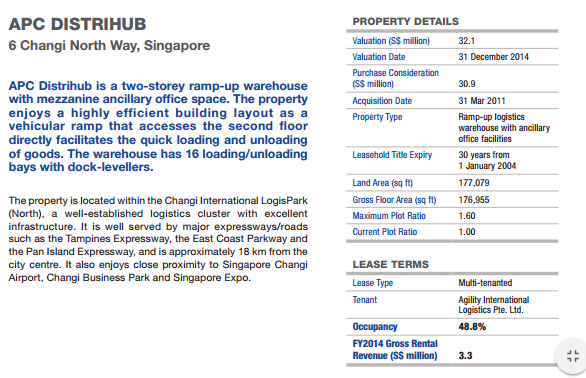 Singapore listed logistics REIT Cache Logistics Trust (dividend yield 9%) 2 days ago announced that they will be selling of Changi Districentre 3. Is Cache making a profit on this divestment? Does it make sense to acquire a property that has such a short land lease? Does the value of the property go down over these 4.5 years? 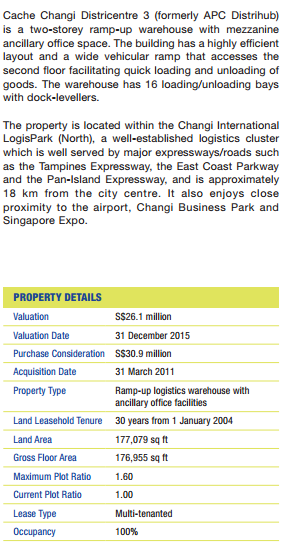 Changi Districentre 3 was bought in 2011 together with another property subsequently after IPO. The price when Cache purchased was roughly SG$32 mil and it was debt funded. I think we will come back to this later. The purchase was with a rather short land lease of 23-24 years. Theoretically, if we purchase a property with such a short land lease, much of our returns in rental is a return of capital (part of the return is your own capital) rather than a return on capital (full return is based on the economic productivity of the asset). When the land lease run out, you return the land to the authority, and you technically do not own the property. The land authority of Singapore have revised the land tenure for industrial properties and the starting lease is short at 30 years instead of 60 years. This means as an industrialist you can purchase a factory much cheaper. However, if you are buying to be a landlord like Cache, Sabana and Aims Amp, you get to purchase your property cheaper, but you can rent them out for less years. This move by authority benefits the tenants more. This is good for society. In recent times you see industrial REITS like Soilbuild Business Trust, Viva Industrial (read here) and Sabana Industrial REIT (read here) purchasing industrial properties with 16 to 24 years of land lease. In comparison the commercial properties and overseas industrial properties tend to be purchased either freehold or greater than 80 years of land lease. 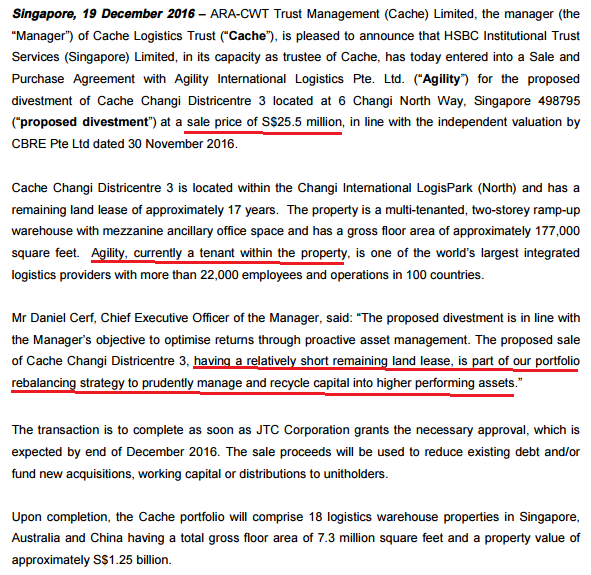 Cache’s manager justified the sale by putting it as capital recycling. The land lease left is about 17 to 18 years. I think this is something as REIT investors we failed to see, in that short land lease properties could be sold off. What can we tell about a Short Land Lease property’s Valuation in Cache’s Tenure? Perhaps we have the theory that land lease doesn’t matter in valuation. In this case as properties aged, with inflation, the property should retain its value rather well. leases was not overly long. when purchased the WALE is 3.3 years on average. While the land lease is short, much of the value seems to be tied to the anchor tenant. The property retains value well, even thought it has always been known to be multi tenanted. When they lost the anchor tenant, the value does not look the same any more. It should be noted that the value does not just tied to the anchor tenant. There are many factors including, the industrial production of the city, GDP growth, also demand and supply . Currently in Singapore, these 3 factors have not been favorable. My experience with investing in Singapore Shipping Corp ( 4% dividend yield) leads me to think there are many assets in this world that is bond like. Singapore Shipping owns a ship that moves cars and they are “rented” to a blue chip shipper such as Japan’s NYK for 15 years. Singapore Shipping have a predictable cash in flow. They can then work out the crew costs, insurance costs, maintenance and dry dock costs and the debt amortization. This deal becomes like a bond. Just like a bond, the high impact risk is the counterparty risk of the blue chip charterer. A long lease property such as those in Keppel REIT (one office property is leased to tenant for 20 years at least), IREIT Global, Starhill Global are as such. Many have asked me what is the market value of the properties or ships if they got sold off and in my opinion much of the value is tied to the tenant. It creates a predictable cash flow, and that predictable nature allows us to value the asset better. Without that predictability, the asset takes its value based on spot rates, and the valuation will fluctuate more wildly. Did Cache and Shareholders get a good deal out of this Acquisition? Let us put aside whether this boost our dividends as a Cache logistics shareholder. Suppose we are a manager, and we purchase this asset with cold hard cash of $32 mil. In the acquisition announcement, when they purchase the multi-tenanted asset, the NPI yield was 8%. NPI, which stands for net property income takes into consideration the gross rental income minus the expenses such as insurance, maintenance, taxes and other fees related to operating the property during the duration of tenancy. 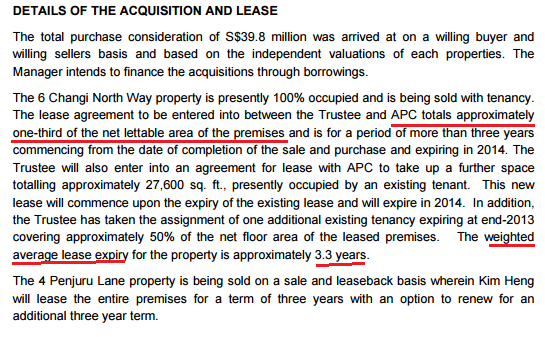 We could assume the Net property income that they aim for is $32 mil x 0.08 = $2.56 mil. If we assume the manager was able to keep the NPI at this level until 2014, and then a drop in NPI follow by a slight recovery, we would be able to calculate the unleveraged internal rate of return. It is how we can compare the prospect of purchasing a ship on the market and a property on the market, which will give you a better numerical return over a fixed tenure. The overall XIRR is 3.52%. We can look at this XIRR as your return per year when you deploy $100,000 to purchase this asset solely. 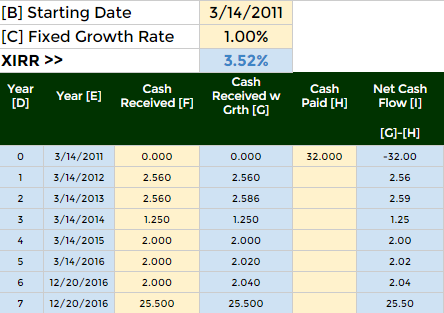 You will earned a return of 3.52%/yr with your capital intact. Your opportunity cost is to put this in a 10 year Singapore Government Bond that yields 2.5%/yr. If we put it that way then the returns do not look as fantastic. When this acquisition is debt funded, the capital outlay goes from SG$32 mil to almost zero. Instead we need to pay a interest expense. We know that Cache Log’s average interest expense is 3.5%. So we have to deduct $32 x 0.035 = $1.12 mil in annual interest expense from our cash flow. 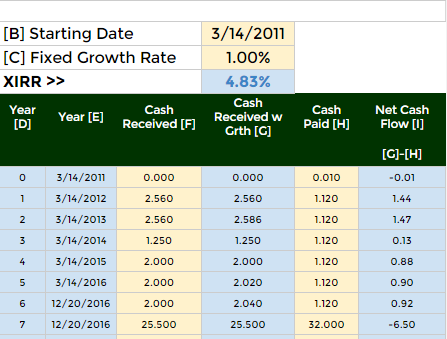 We only earned $5.7 mil in net cash flow after interest. However, our returns have been immensely good due to no capital outlay. A reader point out my mistake, that at the end of the divestment, we have to pay back the principal of the interest only loan. The loan amount is more than the current asset valuation of 25.50 mil. Mathematically speaking we should always take this deal. The time value of money made the $32 mil that we pay off in the last year to be smaller than the value of the $32 mil loan to Cache in the first year. The XIRR still turned out positive and respectable. However, it does outline how even a fully debt funded deal can go wrong. The caveat here: Debt needs to be managed. A good internal rate of return can mean that the REIT manager made a good decision and operating the property well. However, in the grand scheme of things, it is not a wise situation to be in. While I use XIRR or IRR a lot on my blog. Internal rate of return can be used to measure performance not just for properties, ships but also for other financial assets. However, we have to be aware that, the numbers is only part of the equation. There are the qualitative considerations here that is hard to put into numbers. These considerations depends on the roles we are in. Our XIRR and qualitative discussion up to this point have been evaluating more from the Manager’s Role. We are assessing whether these are good buys and good capital allocation. In the Investor’s Role, things are slightly different. If you are in this role, you are evaluating from the point of view that you have no control over what to do with your capital . You have delegate this to #1, the manager. The manager can choose what he or she buys, decide how much to pay out as dividends, choose to sell to recycle the money many decisions. You are in the position #2, you cannot have control like the manager you delegated to in #1. And so you can only evaluate on the performance metrics that you can review such as manager’s past decisions, dividend history, cash flow quality, past acquisition and divestment performance. As an example, suppose you bought a condo. The Manager role takes care of 1 to 3. You take care of 4. As you take care of 4, how do you use your cash flow returns? Do you keep some aside to buy a new property? That is how you compound your money. Or do you spend it. Due to this split roles it presents a problem. 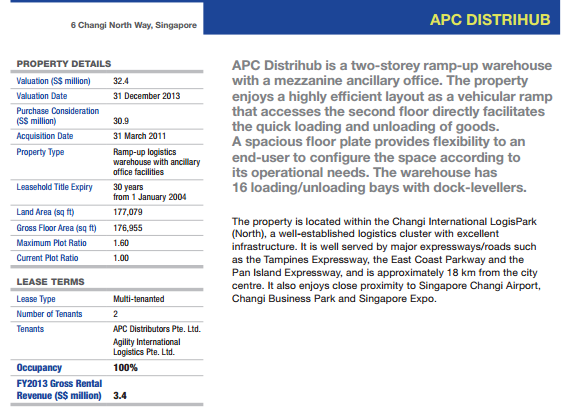 Let us look at this same Changi Distrihub 3 Example. Suppose you bought this property unleveraged. You are in the position of #1. You have shareholders. You will get cash inflows yearly, but you are pressured to pay 100% of this cash flow to your shareholders as dividends. When you sell off the property for $25.5 mil, you actually took a realized loss. Based on XIRR, your returns are positive. Mediocre but positive. But as a manager, you now have only SG$25.5 mil to work with instead of $32 mil. If the job is to generate the same amount of cash flow as previous, if not better, you need to deploy the $25.5 mil to generate greater than $2- 2.56 mil cash flow. From this example, we can see the dangers of taking out cash flows and spending it, and not reinvesting back into the business. REITs need to pay out 90%-100% of earnings and this is why they frequently need to do a rights issue or cash call. However, the alternate scenario can also be true when property value is higher….. Suppose instead of selling the distrihub at $25.5 mil, you can sell it off at $40 mil. This, together with good opportunities, or exceptional management skill, could help boost the cash flow compare to if you have not sell off the distrihub. The third twist, that is for a short land lease property is that at the end of the land lease you do not own any property. To continue to have cash flow, you should have set aside part of the yearly cash inflow from rentals to purchase a property at the end of the 24 years. The XIRR could be 13% over 10 years as an example. At the end of 10 years, there is no more property. This is what we termed as rights issue. Why would anyone buy such a short land lease property? The motivations of seller and buyer can be very different. Property Soul wrote in her book that many shunned those residential properties with really short leases, which is often an opportunity. My experience with Singapore Shipping Corp sold off Singa Ace, which is a really old ship above book value. The ship will be re-purpose for other usage. Agility purchase of the Distrihub may have factored in that this would lower their overall occupancy cost. Instead of a rental expense, this becomes a depreciation. What matters is that there is value versus the opportunity cost of not purchasing. For a lot of REITs, they still see value despite the land tenure! Viva Industrial Trust have 2 that is 16 years. The lessons we can learn here is that, while we can keep talking about the short land lease, this management decision taken by Cache have show us that there are other way out, then to sit on the property and wait until the land lease is done. They have the option here of redeploying the money to a 7% CAP rate and free hold property. The profile then would be very different. Hi, I googled that it is possible to apply for land lease extension with SLA subject to approval and paying a land premium. Love reading your analysis with supporting data from various sources always. If I may ask, are you still holding your day time job as software and system support specialist or a full time investor by now? Hi reader, i am still holding a full time job as a system support specialist. thanks for the support! In xirr computation, shouldn’t we include the 32million repayment of loan? Hi DW, you are right, I probably missed that out. Now that I think about it, perhaps we lost all the gains back.